Veteran Icelandic keyboardist reunites with longtime friend, two-time Grammy® winner Paul Brown, for a soul-jazz album with a purpose: spreading harmony, love and understanding. 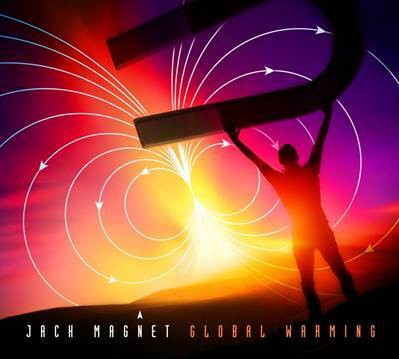 There is nothing in the ten new songs that make up Jack Magnet’s Woodward Avenue Records’ debut, “Global Warming,” released Friday, that will inflame naysayers who deny climate change or its impact on the environment. It’s not that kind of album. Iceland’s popular musical export is on an entirely different mission: to reset minds using instrumental tunes to bring back love, peace and understanding to the world. Reteaming with his collaborator and friend of more than four decades, two-time Grammy®-winning producer Paul Brown, the keyboardist also known as Jakob Magnusson reenters the U.S. marketplace with the first radio single, “Still Boppin’ Along,” a jazz-funk strut. “’Global Warming’ is all about spreading the positive, showing empathy and warming up to one another, regardless of place of origin, faith, color of skin or political views. This album is not about climate changes and environmental threats. It is about old and new friends coming together to ignite warm human emotions, seeking to counterbalance all the negativity, the conflicts and threats we´re witnessing in so many places around the globe,” Magnet explained. Magnet’s message of harmony is ingrained in the DNA of the nine new compositions he wrote with Brown after the two reconnected at a 2012 jazz festival held in the world’s northernmost capital of Reykjavik where the famed Fender Rhodes keyboardist is based. The pair has roots dating back over forty years when as teenagers, Magnet - then Magnusson - moved into the Brown family home in the suburbs of Los Angeles. “Still Boppin’ Along,” which gets a boost from contemporary jazz hornmen Rick Braun and Elan Trotman on trumpet and saxophone, was originally penned decades ago during the duo’s pre-fame days yet it is thematically suited to the tone of “Global Warming.” Brown, who plays guitar throughout the session, lends an American vibe to Magnet’s Euro-leaning pop-jazz-blues-rock predilections. Magnet and Brown’s “Global Warming” set list is heavily influenced by music from the Mojo Triangle – New Orleans, Nashville and Memphis. Magnet’s impassioned and lyrical keyboards emote vibrant and joyous melodies, paint poetic and ethereal reflections, and stir emotions with storming sermons. Brown’s sister, Kathy Brown-Babylon, gets in on the act with vocal embellishments on “From The Other Side,” an aptly-titled song that she wrote with her late husband, Elton John’s longtime bassist Guy Babylon. Paul Brown was a bandmate of Magnet’s in a British blues-rock group long ago fronted by Long John Baldry for which Magnet served as a replacement for the original keyboardist, Reg Dwight, who became Elton John. Also performing on the cut is the late drummer Ricky Lawson.